Complications can be divided into two categories: complications during the surgery (surgical complications) and complications after the surgery (post-surgical or post-operative complications). A complete flap is not made. This is usually due to poor suction of the Keratome while making the flap. The keratome gets caught with eyelashes or the drape. Malfunction of the keratome is a rare occurrence. There is a hole in the flap. This can be due to poor suction of the keratome, malfunction of the keratome or problem with the blade. During development of the corneal flap, the corneal epithelium is damaged. This will cause increased pain after the surgery and may predispose the patient to other complications. This can be caused by not performing the flap properly by not centering the keratome on the cornea. Many people who wear contact lenses have vessels that grow into the cornea and can be cut while making the flap. This is usually not a problem and the bleeding can be stopped with gentle direct pressure. It is common that while the suction is applied to the eye while the corneal flap is being formed, conjunctival blood vessels may rupture. You may notice a small hemorrhage on the sclera (white portion of the eye). The keratome cuts all the way across the cornea and does not leave a hinge to hold the flap. This can be caused by problems with the keratome. The femtosecond laser cuts the flap too thin due to gas bubbles leaking into superficial layers of the cornea. Bubbles make their way into the anterior chamber which can interfere with laser tracking during the surgery. Folds, wrinkles, or striae may develop in the flap post operatively. This can be caused by the patients rubbing their eyes, poor positioning of the flap, and/or thin flaps. They can be fixed in the surgeon’s office. The corneal flap is not centered on the cornea. This can be caused by patients rubbing their eyes, poor positioning of the flap, and/or thin flaps. The flap can be repositioned by the surgeon usually in the office. Epithelial cells get under the flap and can grow resulting in blurred vision, pain, redness and light sensitivity. Poor management of the flap edges, button holes, free flaps, epithelial defects or abrasions can lead to ingrowth of epithelial cells. If they are severe enough, the flap can be lifted and cleaned of the cells and replaced. Patients commonly have dry eye problems related to the flap formation. Cutting through the corneal nerves leads to decreased sensation and dry eyes. This will improve over time and is treatment like any other dry eye syndrome. Corneal ulcers or infectious keratitis can occur after LASIK. Bacteria can cause an ulceration in the cornea which can lead to sever loss of vision. Surgeons have patients use antibiotic eye drops to keep this from happening. 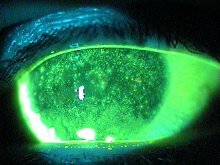 Diffuse lamellar keratitis can occur after the LASIK. The exact known cause is not known but most feel it is a reaction to material getting under the corneal flap. It is also called sands of the Sahara due to its appearance of looking like sand in the cornea. Ectasia is characterized by the cornea protruding abnormally forward in one area of the cornea similar to keratoconus. Ectasia is due to the cornea being too thin after the LASIK allowing for this to happen. The surgeon will make sure that you have enough corneal tissue after the LASIK to minimize the chances of the complication. Even though there are many types of complications from LASIK surgery, the surgery is highly successful. You have a 95% or better chance of doing well after LASIK surgery.